The determination of intermittency from experimental results has been achieved in the past by a number of approximate methods, the most prolific of which involves the use of a detector function based on the square of first and second derivatives of the flow velocity with respect to time. The disadvantages of such methods are that they rely on appropriate time domain binning of the data, they are calibration dependent, they involve error propagating numerical differentiation and 50% intermittency is incorrectly diagnosed as an extremely high level of turbulence. Where experimental records are of limited time spans, calibration is difficult, measurement errors are significant and a 50% intermittency measurement is required for design purposes, the detector method loses its utility. However, recent experimental and theoretical work by Ferchichi and Tavoularis  has revealed a remarkably Gaussian probability distribution for the thermal passive scalar. The degree of self-similarity (analysed through the flatness of the signal) can then be used as a measure of intermittency. 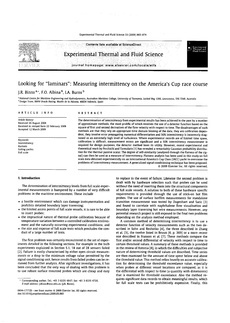 Flatness analysis has been used in this study on full scale data obtained experimentally on an International America’s Cup Class (IACC) yacht to overcome the problems of intermittency measurement. A generalised signal conditioning technique has been proposed.